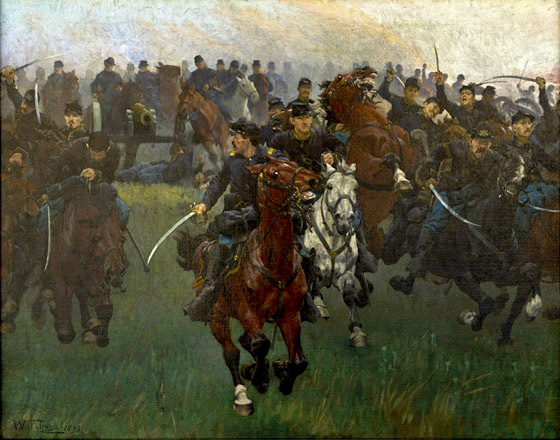 The painting is one of seven commissioned by publisher George Barrie of Philadelphia as illustrations for his monumental work The Army and Navy of the United States, published in Philadelphia, 1889–1895. The painting was reproduced in section 3 as a photogravure, 9½ by 13¾ inches, hand colored in deluxe editions. The image was also issued separately as a black-and-white mounted print. A photograph taken in Trego’s studio in 1893 shows the artist sitting in front of his easel working on the painting. Trego shows the threatened artillery pieces, partially obscured by smoke, just behind the line of cavalrymen as they start on their wild charge. The withering fire the riders face is indicated by the fact that two of them have already been shot. In an image typical of Trego’s battle scenes, the soldier leading the charge turns to see one of his comrades about to fall from his saddle. One of the horses is rearing back as though wounded, while close to the center of the painting, the eye of a terrified horse seems to look directly at the viewer, signaling to us the extreme danger of the moment. Not far behind him, the eyes of a soldier, just visible over another horse’s head, reinforce that impression. As “The Federal Charge at the Battle of Gaines Mills,” in Guy Carleton Lee, ed., The History of North America (Philadelphia: George Barrie and Sons, 1905). As “Charge of the Fifth Cavalry at Gaines Mill,” in John K. Herr, The Story of the U.S. Cavalry, 1775–1942 (Boston: Little Brown and Co., 1953). As “5th Cavalry Charging at Gaines Mill, Virginia, 1864,” in Mary Lee Stubbs, Armor-Cavalry (U.S. Department of the Army, Office of Military History, 1969). This image has proven to be one of Trego’s most popular. In addition to the prints that sold well in the late nineteenth century, prints and even hand-painted oil copies of the work continue to be produced and made available today. The painting has recently been cleaned and conserved and is in excellent condition.